There seems to be an inverse relationship between the president's popularity and the mainstream media's willingness to tell stories that need to be told. As Obama continues to slide in the polls, I'm sure we will find out all kinds of stuff that may have helped 2.5 years ago. While its too late now for everyone impacted by this administration's economic choices, there's hope that everyone will vote more responsibly next year... on both sides of the aisle. Put simply, if the Climatards are willing to waste billions enriching themselves in the name of green energy, then they can't really take the global warming scam seriously. In other words, the green tech movement no more believes in global warming than you or I. And, once again, where's the special prosecutor? 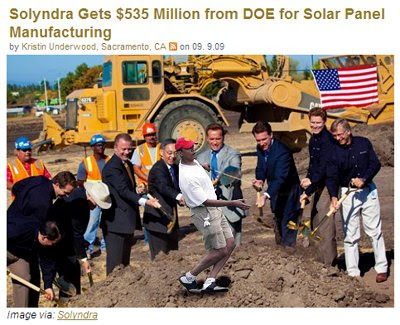 Postscript: The Bush administration rejected Solyndra's requests for loans for two years citing incomplete documentation. I'm going to guess that Nancy Pelosi is ticked that she didn't get any of this action. Nothing to see here folks, move on.